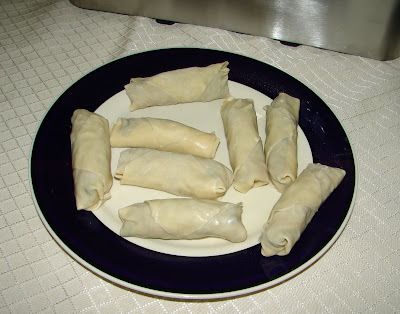 This week for Tyler Florence Fridays I made Tyler's Wild Mushroom Spring Rolls but changed the wrapper and made them Egg Rolls. 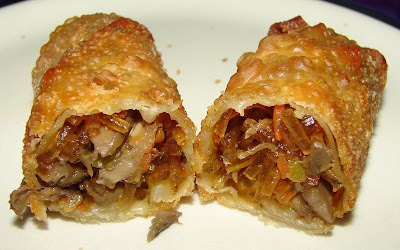 I absolutely love Spring Rolls but they do not sell the wrappers around here, and trust me, I've looked. 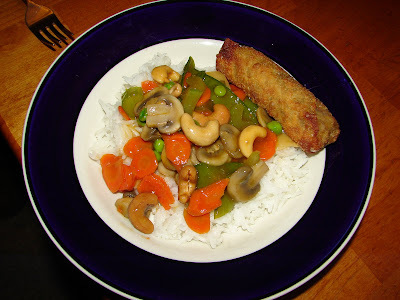 To go along with the Egg Rolls I made a quick Cashew Veggie Stir Fry served over jasmine rice. Everything went together nicely and was a delicious meal. Heat oil in a skillet or wok over high heat. Add the garlic, ginger, and scallions and cook for 1 minute. 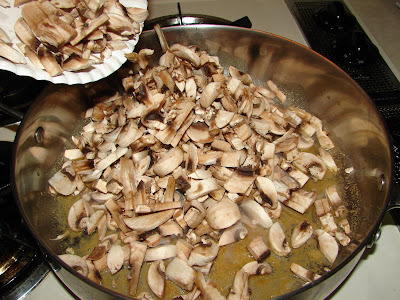 Add the mushrooms and cook for another minute. 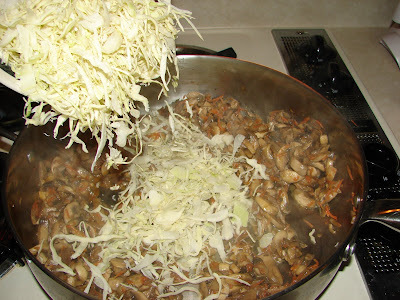 Add the cabbage and carrot and cook until the cabbage starts to wilt, about 2 minutes. 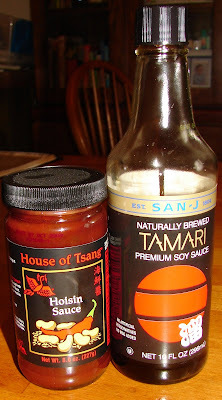 Stir in the hoisin and oyster sauces (I subbed tamari for oyster); toss to coat the mixture. Remove from the heat and mix in the noodles, sprouts, and cilantro; season to taste with salt and pepper. The filling should be moist but not wet. Remove from heat and allow to cool. 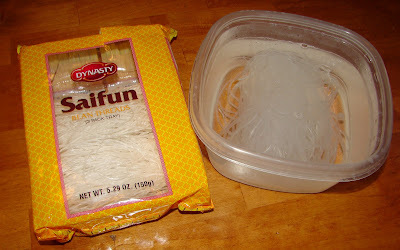 Lay a spring roll wrapper on a flat surface on an angle so it looks like a diamond. 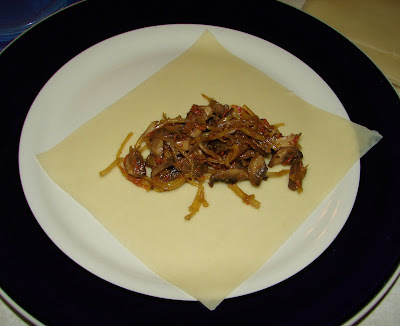 Spoon 2 tablespoons of the filling near the bottom corner of the wrapper and fold up to enclose the filling. Fold in the 2 sides. Paint the top seam of the wrapper with beaten egg. Continue rolling up to form a tight cylinder. 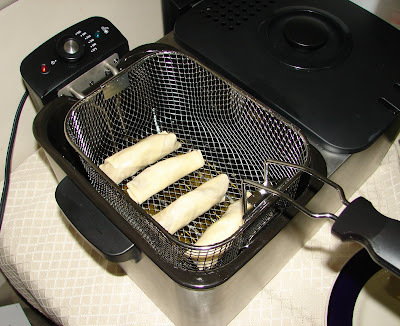 Pour about 1-inch of oil in a skillet or wok and heat to 350 degrees F. (easier to deep fry if you have that option)Fry the spring rolls, turning to cook all sides, until browned, about 2 minutes. Drain on paper towels and keep warm. Serve with Mustard Dipping Sauce. 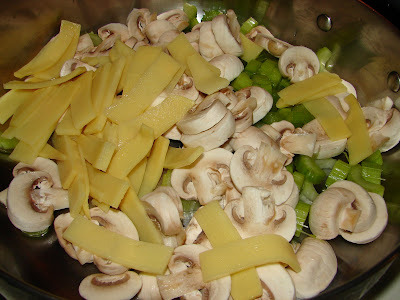 For the Mustard Sauce: Mix all ingredients together and stir until the sugar dissolves. 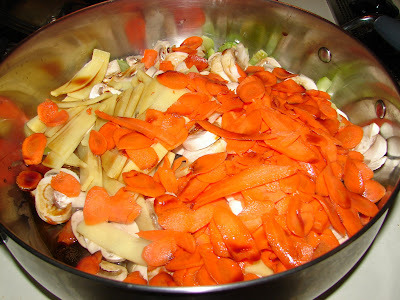 You could also add garlic, ginger, peppers, etc. to your liking. In large wok or skillet over medium high heat coated with a little oil or cooking spray saute all veggies except frozen sugar snap peas for two minutes stirring occasionally. Stir in vegetable broth and tamari/soy sauce and frozen sugar snap peas and cover and simmer over medium high heat for five minutes, stirring occasionally. While that is simmering, prepare your water cornstarch mixture. Turn heat down to medium low and quickly stir in the cornstarch water mixture and let the sauce thicken while stirring for about 45 seconds or so. 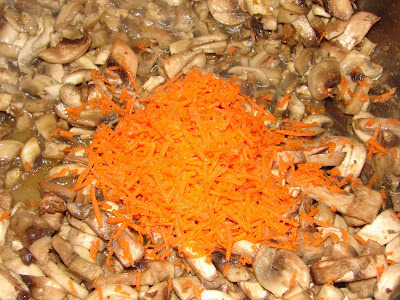 Turn off heat, stir in cashews, and serve over rice (or Asian style chow mein or lo mein noodles). 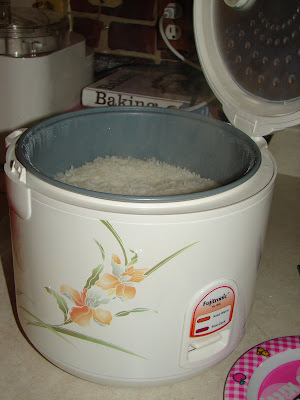 I love my 10 cup fujitronic rice cooker! It's not the fancy fuzzy logic kind but it does a great job. 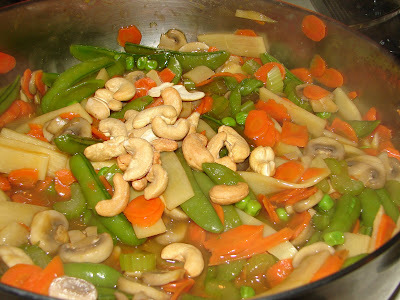 That is such an easy basic stir fry livened up with the cashews. Don't cashews just make any meal special? 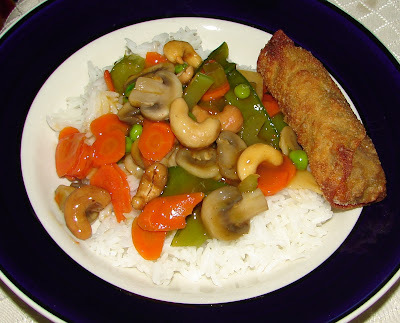 I ended up making this because whenever we ate out at a Chinese restaurant for dinner someone would order Cashew Chicken and the cashew veggie sauce would look delicious, so I decided to try to create something with just cashews and veggies in sauce at home. I always have so much fun trying to do restaurant copycat recipes. Results and Changes: For Tyler's Spring Rolls other than changing the wrappers from spring roll to egg roll, I also didn't have the bean sprouts (which I'm sure would have been wonderful) or the oyster sauce (I know they have vegetarian oyster sauce, usually mushroom based, but I am out) I had so much fun using the bean threads (aka cellophane or glass noodles) I had purchased a pack a while ago and they sat in the pantry just waiting for the perfect recipe to try them in. 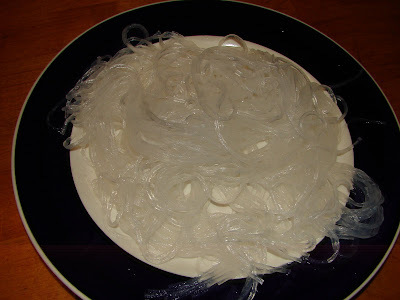 Tyler's recipe only uses about 1/3 of the pack so be on the look out for some more glass noodle recipes coming up :) I love vegetable spring rolls with bean threads at restaurants so this was nice to try at home. The flavor was great and the garlic and ginger really stood out. The filling could almost be a meal on it's own, it was delicious! 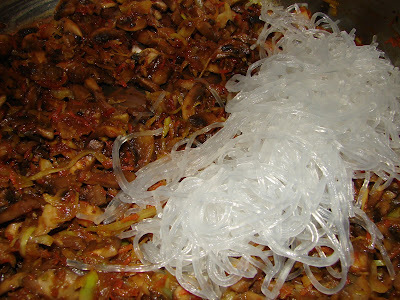 If I am able to locate some spring roll wrappers you can bet I'll be making these again, and I will be on the lookout for some Chinese Wood Ear (black) mushrooms, which would be perfect in these, you can usually find them dehydrated at Asian markets then you soak them and thinly slice them. My youngest two sweeties also loved these which was a plus, and I had my mom over for dinner who also gave a positive review of the egg rolls and stir-fry.